Thailand has a "floating market" just North of Bangkok: http://www.pbase.com/dougj/damnoen_saduak_floating_market_thailand. The Thai version is nice to visit, and is geared towards tourism. 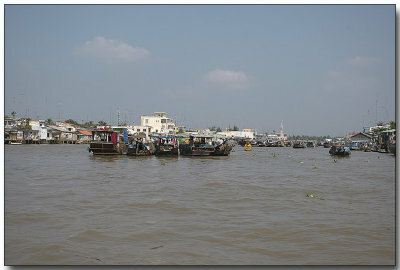 The Vietnam floating market is in a different class, there is a lot of large volume wholesale trade and transportation.